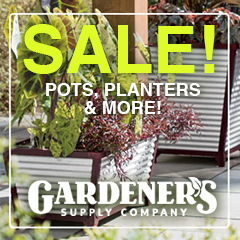 Container soil mix or potting soil, without regular additions of fertilizer, will not sustain a sufficient supply of nutrients to your potted plants through the growing season. Generally it’s a good idea to mix a time release or dry fertilizer into the soil in your garden planters before planting. Then use a liquid fertilizer throughout the growing season to replenish water-soluble nutrients that are washed out of the soil by frequent watering. Fish emulsion, seaweed extract or a combination of the two works well. A good all-round fertilizer suitable for most plants is 20-20-20. This means the compound has equal portions of nitrogen (N), potassium (P) and phosphorus (K)—the primary plant nutrients. In addition to N, P, and K, plants need other elements in smaller quantities for proper growth and development—magnesium (Mg), iron (Fe), calcium (Ca), boron (B), zinc (Zn), manganese (Mn), sulfur (S), and others. Feed your plants at least once a week through their growing season. Some gardeners advocate feeding their garden planters with diluted fertilizer with each watering. Hanging baskets will definitely benefit from this technique. For perennials in planters, start feeding in March and then stop feeding in mid-August to avoid promoting growth too long into the fall and winter. Over-fertilizing can be as harmful as under-fertilizing—producing weak growth that is susceptible to pests and diseases. Over-fertilizing can also cause salts to accumulate in the soil, causing problems for the plant roots. A sure sign of salt build-up is that white crust that develops on the surface of soil or on the outside of clay or terracotta planters. If you’ve run into this problem, run water through the soil continuously, until water runs out the drainage holes. In the winter, re-pot the plant if it is a perennial and scrub the pot to remove the salt build up and use fresh soil for planting next season. Never fertilize dry soil—water plants thoroughly at least a day before fertilizing. Nutrients in contact with dry roots can burn sensitive root hairs. Wait two weeks before fertilizing new plants or transplants. Never fertilize your plants on days when the air temperature is over 85° F.
Different plants have different fertilizer needs—find out what your plant prefers and keep to a regular schedule.